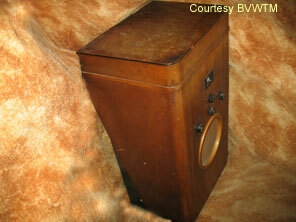 Shown above is the Murphy A30RG, in a comparatively plain cabinet similar to that of the console version. 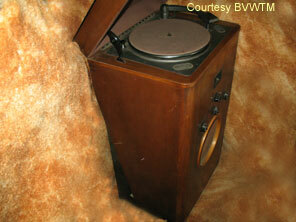 The only main difference is the circular speaker aperture seen on the radiogram version. Note also the sides of the cabinet, which are not of straight veneered panel design. Unfortunately it is not so obvious in the photos, but reference to the thumbnail sketch in the range table at the end of the 1936 page may make it clearer. The sides are full depth veneer panel at the top, but are cut away down towards the base of the cabinet. 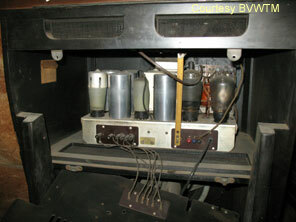 A black painted recessed frame serves to support the instrument. The record desk is a Garrard single play model on integral heavy metal coppered plate (see picture below). The rear view shows that a card back has been provided which incorporates ventilation slots. Also there are two meshed vents at the top back of the cabinet. As the cabinet is rather deeper than the chassis due to the record deck needing to be incorporated, the extension loudspeaker, aerial and earth sockets have been extended to a “daughter” socket strip on the rear panel. Note the mechanical linkage from the record deck above to the toggle switch at the rear of the chassis towards the right hand side. Alongside aforesaid linkage the pick-up leads from the record deck are connected to the chassis input via the red and blue wander plugs. Valve line up is AC/TP, AC/VP1, AC2/PENDD, UU3.